There’s a lot to do in Red Dead Redemption 2. There’s so much going on that even when I head into a town for a few errands I’m besieged by things to buy, strangers to help, and places to rob. But there’s a guy in Valentine I always make time to speak with, whether I want to or not. It reminds me too much of a situation in my real life. My first time in the town of Valentine, I spotted a one-armed man sitting on the ground begging for food. He appears to be a wounded Civil War veteran. Having studied a bit of the cultural history of the Civil War (I cannot recommend enough the fascinating This Republic of Suffering, a history of how the Civil War changed Americans’ understanding of death), I went over to see if he had anything interesting to say about the time period or the war’s after-effects. He was effusive and chatty, and he seemed a bit unusual but generally harmless (something you can’t say about a lot of strangers in the game). He told me a convoluted story and got a bit overly friendly. As protagonist Arthur, I made small talk and then went on my way. On subsequent returns to Valentine, I felt like I suddenly saw this guy everywhere. There he was by the train station when I just needed to pay my bounties. There he was in the saloon when I just wanted to play bar games. I’d see him coming and think, I don’t have time for this right now... and then I’d go over and enter into an interaction with him. It wasn’t for the honor boost of talking to people in town (though I’m badly in need of honor, given all the people I keep running over with my horse). Even though he’s just a video game character, avoiding him felt overwhelmingly rude. It seems like our interactions matter to him, and I don’t want to be impolite. My inability to avoid this character in some ways mirrors a situation in my real life. Around midnight several months ago, I got in a conversation with a person in my neighborhood that went a bit too far. He told me he needed help getting a room at a nearby shelter, and I was naively happy to try to help him navigate the bureaucracy. This task then grew to require multiple stops, various people, and a lot of complications that I didn’t think added up. Things started to feel more and more sketchy until my common sense prevailed and I excused myself, though not before giving him more money than I felt comfortable with. After that, I saw him in the same area most days, and he’d pushily corner me with a new mishap that required more money than the time before. When I mentioned the guy to my neighbors, they said they’d been hearing the same stories from him for years. Many had given him a lot more money than I have or become overly-involved with him before cutting him out of their lives. He’s been threatening to several of them, but no one is particularly scared of him. Everyone advised me to be firm about my boundaries and not let him rope me in further than I wanted to go. As I see it, this person in my neighborhood is just someone doing what he needs to do to survive. He might not make his money or access shelter in the way that I do, but I don’t want to judge the circumstances that led us to do things differently. I don’t like feeling lied to, but no one wants to be thought of as a sucker. Homelessness is a systemic problem, and I don’t particularly care what he does with any of the money I give him. But I still dread our long conversations and the awkwardness of wanting to dispute his stories but being too meek to do so. I don’t know how to stand my ground. I know I’m capable of setting boundaries, but in this situation, I keep failing to call on any of those skills. The veteran in Red Dead isn’t lying to Arthur, as far as I know (I have a lot of game left to play still). I haven’t found a real reason to avoid him besides it reminding me too much of my real-life situation. 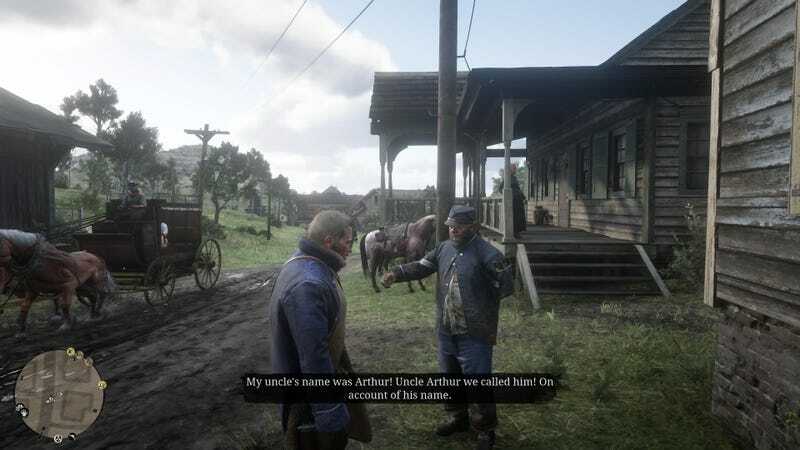 Arthur is a much more confident, standoffish person than I am, and the last time I saw Red Dead’s veteran, I wondered if I could use the moment to practice setting boundaries. I saw the veteran coming and decided this would be the time I avoided him. I had things to do, and I didn’t owe every character in this sprawling game my time or attention, and it didn’t mean I wouldn’t help him in the future if he needed it. But I immediately felt bad. As I tried to work up the motivation to turn the corner and get away, the veteran approached, and I clicked the button to interact with him. I sighed at myself and waited out our dialogue. People in real life are of course more complicated than characters in games. They don’t run out of things to say and go on their scripted paths, and there’s no programmed end state to our interactions. Red Dead’s veteran reminds me of something that’s stressing me out in my real life, a less fun kind of roleplay than games can sometimes provide. I know there are “fake” beggars in the game, though I haven’t gotten to them yet. Maybe when I run into them I’ll be able to practice setting boundaries. But for now, I take the long way home to my apartment and always stop to talk to that guy in Valentine.